Yep, only a couple hours and we're all fixed now over at the message boards!! Why don't ya join us over there, it's fun and there are some great people chatting about all kinds of fun stuff! http://www.kisscropnshop.com then click on message boards!! Just a simple registration and you can chat with us, ask questions, meet fellow scrappers, play some fun games and find out the scoop on all our events! See ya on the other side, LOL!! Yep, our message boards have been hit AGAIN!! Those turkish groups must really have something against scrapbooking!!! I'll let ya know when it's corrected, in the mean time have fun scrapping and feel free to post here!! 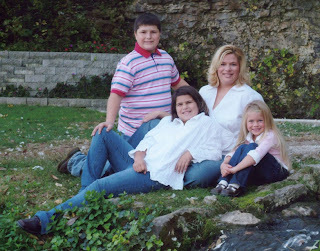 This is a picture of a friend and her three children taken not too long ago. They are an average family, single mom of a 13 year old son, 12 year old daughter and 7 year old daughter. Laura, the mom is a very devoted mother not only to her three children but all the children in our community of Granby. She's taken in many, many children over the years, some living with her, others just knowing her home is a safe place to be. Laura's car was always full of children taking them to ballgames. She's the mom that all the kids like.... fun, a bit crazy and just a great person. Laura is also the mom that surrounds herself in everything having to do with her children. Her home is filled and I mean filled with photos of her children and there's nothing she wouldn't do for them!! Laura is also fighting for her life!! She was in a single car accident on November 19th, throwing her from her car. She has suffered severe brain trauma. The doctors can't tell the family if Laura will make it or if she does what type of life or quality of life she will have. The swelling is just too much and until it reduces they can't determine the outcome. They have said the swelling can be anywhere from months to 5 years. The family is of course devastated. They have prepared themselves for the worse, even have prepared to take her off the machines and let her go but each time they do this Laura shows signs of improvement or that she is fighting. It's been an emotional rollercoaster that no person, let alone three young children should have to face!! Laura's mother and sister have moved here to gain temporary custody of the youngest child and care for all of the children in the hopes of keeping them together and in their schools, with their friends for as long as they can. This means Laura's family is facing the expenses of three households, Laura's, her mothers, and her sisters as well as the expenses of traveling back and forth to the hospital. The community of Granby and Laura's friends are hosting a benefit in Laura's honor, hoping to ease some of the issues facing this family. We will be hosting a chili feed, silent auction, bake sale and Gospel sing at East Newton High School on February 10th from noon to 3:00pm. We would LOVE to have you join us in helping this family! We are also currently collecting donations for the silent auction. If you have a business that you'd like to promote or if you'd like to donate some new scrapbooking items to be included along with gift certificates and merchandise from KISS please email me at info@kisscropnshop.com. I've also got flyers if you have places that you can hang them to get the word out. We thank you for reading this, for your prayers and for any support you may be able to give. Lastly, give your kids a hug and kiss, I know for a fact Laura would do ANYTHING to be able to do that again!!! It's January 17th....know what holiday is today? It's Get to Know your Customer day! Yep, it's official! It's on the calendar! We're celebrating by playing a little game over on the message boards at http://www.kisscropnshop.com. One lucky player is going to get a little prize package from me!! All you have to do is answer a question and post another question. We'll play until the end of the day and one lucky poster will be drawn randomly to receive the prize! Happy Get to Know your Customer day!!! While there you can register for Scrappin' U - February and Spring Fling!! Wow!! What fun!! Very laid back and so much fun. I love to see how new people make friends so quickly at these type of events. Did I mention the food? YUMMY!! So anyone up for some more Scrappin' U in February? I'm looking at the 9th, same location from 10:00am-10:00pm. $12.00 and was thinking we'd order in pizza for supper, everyone pitching in a bit to cover the cost. What do you all think? Who's gonna join me? Thanks again to all who attended, it was great fun and I enjoyed spending the day with ya!! If you are planning to attend or know someone that is planning to attend the January 12th Scrappin' U event it has been MOVED to a NEW location!! Yes, there were some double booking issues but all things happen for a reason and all is GOOD!! We will be meeting at Ozark Realtors on 7th and Florida. If you are familiar with Joplin, there is the old Aldi's building, a UHAL building and a Thai Restaurant on the corner of 7th and Florida. Ozark Realtors is just South of the Thai Restaurant with parking in the back. Please pass the word and we'll see you tomorrow!! In planning this years events I would love to find out what you want! I'm working on the bus trips currently and am considering a few options. We would go up on Saturday, October 11th, attend the Creating Keepsakes show and visit one store. We would go up on Saturday, August 23rd, attend the Creating Keepsakes show and visit one store. We would go to Kansas City June 28th, shop at 5 stores. We would go to Tulsa on June 28th, shop at 5 stores. For those new to our bus trips, when we do a Creating Keepsakes show you get a t-shirt, free pass into the Creating Keepsakes show, a goody bag and the KISS Bucks auction. Many vendors offer specials or discounts. When we do the Round Robins we go to 5 stores. You get a free t-shirt, a M&T or mini class at each store, goody bag and KISS Bucks auction. Many stores offer specials or discounts. Please take a few minutes to answer our poll to the left so we can make our decision. If you have other ideas on places we could go or things we could do PLEASE post them here!! I want to hear from you!! I can't get the pictures loaded onto the website so I'll post them here. If you are interested in taking any of the classes you may register online at http://www.kisscropnshop.com/ under Scrappin' U or you may purchase tickets at the door. Limited seating available for each class and will be sold on a first come/first serve basis. If you aren't able to attend the scrapping portion of Scrappin U' you can still take the classes! Simply register online, arrive 5 minutes prior to the scheduled class time and take a class with us!! 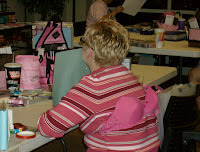 Classes all come with materials pre cut for you with the exception of your ribbons, instructions and all materials needed to complete the picture posted. Wow!! What a year K.I.S.S. Scrapbooks had last year! Just wanted to share some of the highlights as I've been reflecting the past few weeks on the business side of K.I.S.S. Scrapbooks, where it was, where it is and where it is going! Thanks to many very loyal friends (I can't say customers, you're way more than that to me!!) and tons of new ones, K.I.S.S. is excited about 2008. Let's take a journey back to the beginning of 2007. Our first event of the year: Spring Fling held on March 3rd. What a great day this was!! Queen Hailey raised money for her 4-H, many of you got loaded up on the blue lights and the crazy paper sale and of course Janet and Janice had their run in with the ummmm....cow!! We met many new friends at this event thanks to those that are spreading the word!! April brought us to our Crop for the Cure benefiting Tina Mosely of Stark City. The 35 croppers that attended raised an incredible $1100.00 for Team Tina and Relay for Life! Wow, now that's amazing!! 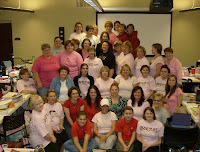 We had ladies from Oklahoma, Arkansas and Kansas at this event!! Not to mention the local gals!! June 2nd had us hitting the city, Kansas City that is!! We left Joplin at 7:00am and returned at 1:00am aboard a charter bus!! 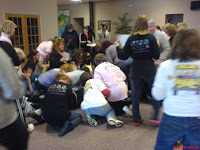 Yes, the crazy ladies pictured below REALLY did shop that long!! I was worried that we may need to rent a U-Haul to get all of the packages back home!! The stores we shopped at were awesome!! June was also a tough month for our family, we lost Nanny a very special person in my life and a driving force behind the scenes of my business. During all of this and with the awesome determination of the Stockton Crop for a Cure team the crop went on!! Held on June 16th, the croppers at the Stockton Crop for the Cure raised $400.00 to benefit the Relay for Life. Thanks ladies for allowing me time with Nanny and keeping the crop going!! August 25th had us hitting the road again, this time to the Creating Keepsakes show in Tulsa, Oklahoma!! So much fun and the goody bags, WOW!! What fun to dig through all those awesome goodies!! Met many new friends at this show and some even joined us the following month to crop with us!! September 28th and 29th we were talking, wearing and I think even eating PINK!! We cropped for two days to benefit Scrap Pink, a nationwide event to promote, raise awareness and find a cause for breast cancer. What an honor it was to be able to donate over $900.00 to the cause of breast cancer. We even had a visitor, my sister-in-law stop by. She was and is currently fighting a battle with breast cancer. The creative ways to decorate bras blew my mind, who knew? And give a girl a hot pink, very large bra and the opportunity to win prizes and you never know what she'll do!! 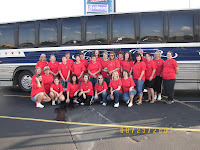 October 13th took us to Greenfield, MO where we raised an amazing $887.19 for the Relay for Life team. The ladies there were on a mission to raise money for the cause and money they raised!! Our penny auction was a huge hit!! Not fun counting all those pennies but the cause made it worth it!! Bras decorated in crazy ways were a hit and so much fun!!! Will add pictures at a later date for this event. Still trying to get copies and get mine downloaded!! "Who would ever have thought a bunch of women could get together, cut up a bunch of paper and pictures, glue it together, loose hours of sleep, snack too much, laugh till our sides hurt and tell every one what a wonderful time we had. Well, that's what scrapbooking crops are!!" Often times we find ourselves questioning what we are doing, who we are and if we are doing what we are suppose to be doing in life. I have to tell each and every one of you that attended a K.I.S.S. event in 2007 that you are allowing me to do exactly that! What I feel I am suppose to be doing, what I'm meant to do and what I want to do. Thank you from the very bottom of my heart and here's to another fantastic year of cropping, shopping, making memories, sharing memories and making a difference in the world!!! Thank you for supporting K.I.S.S. events, the causes, the charities and the groups we work with!! You all are an amazing group of ladies!! Check out our post tomorrow and the poll that will be opened tomorrow to find out what the plans are for K.I.S.S. 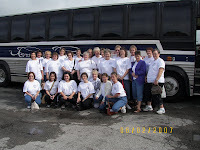 2008 and how you can become a part of the greatest group of friends, scrappers and loving hearted ladies in the Four States!! Hey scrappers? What are you doing this Saturday, January 12th? Why not join us for some Scrappin' U? It's a full 12 hours of cropping time, fun and I'm sure lots of laughs!! We've got some great specials planned in the KISS store that you'll want to be sure and check out. Classes will posted on Monday and may be purchased until Friday the 11th or at the door. For those planning to attend, jump over to the message board at http://www.kisscropnshop.com/ and share what you will be bringing for our potluck supper. All details including time, price and location are located at http://www.kisscropnshop.com/. Just click on Scrappin' U. You'll be able to register there as well. Prizes are on their way to your home!!! Have fun and I'd love to see projects that you make with them! Kansas City MO October 10th-11th. I'll also be teaching at many other CK shows for Lickety Split so if you are going to be traveling this summer email me, I'll get ya a list of the shows. Of course, if I'm not teaching Wendy is and she ROCKS so you can't go wrong!! For a sneak peak at the new 8 x 8 Disney Board Book class and the new and incredible Heart Shaped Chipboard Album class check out Wendy's blog. http://www.licketysplitscrapbooks.blogspot.com/ She does amazing work and you'll not be disappointed by any of the classes presented by Lickety Split. Here's a peak of ONE set of the TWO double page layouts that you'll be getting in the Easter/Simply Amazing Layout class. You'll be able to see the Easter page designed by Wendy on their blog later this week. Hope you'll join us in the classes and as always if you're seen at any of the shows with a KISS shirt you'll get a free gift! !